One of the world’s best-selling female artists in history, Shania Twain, will be extending her ROCK THIS COUNTRY tour into the Fall of 2015, due to overwhelming fan demand. This will be her first North American tour in more than 11 years, and the now 67 date run comes hot on the heels of her hit two-year residency in Las Vegas at The Colosseum at Caesars Palace. 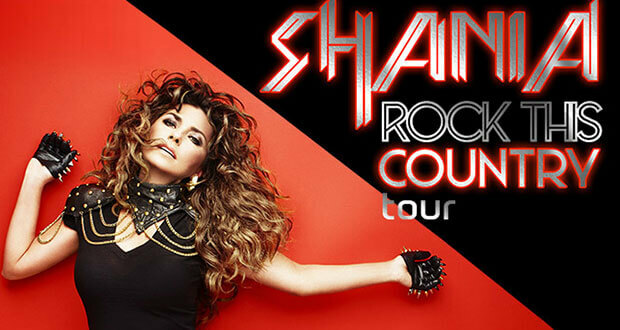 Presented by AEG Live, ROCK THIS COUNTRY will give fans one last chance to see Shania perform her extensive catalog of iconic hits in a brand new production. The fall leg kicks off in North America on September 12 in Spokane, WA, stopping in Portland, Columbus, and Albany. Additional Canadian dates include two nights in Calgary, as well as Quebec City, with the final show set for Toronto. Public on-sale for most US dates begins Friday, May 15 at 10:00 am local, and for Canada, Friday, May 22 at 10:00 am local at ticketmaster.ca. ShaniaTwain.com presale for most US dates begins Tuesday, May 12 at 10:00 am local through Thursday, May 14 at 10:00 pm local, and in Canada, will run from Tuesday, May 19 at 10:00 am local through Thursday, May 21 at 10:00 pm local. Additionally, American Express® Card Members can purchase tickets through Front Of The Line for the Canadian shows only before the general public beginning Tuesday, May 19 at 10:00 am local through Thursday, May 21 at 10:00 pm local. A limited number of exclusive VIP Packages also will be available. These offers can include premium reserved tickets, access to Shania Twain’s preshow VIP sound check, exclusive merchandise and much more. A $1.00 donation from each ticket purchased will go to the Shania Kids Can Foundation. Grammy Award nominated singer/songwriter Gavin DeGraw will be the special guest for most fall dates.